Master Sgt. 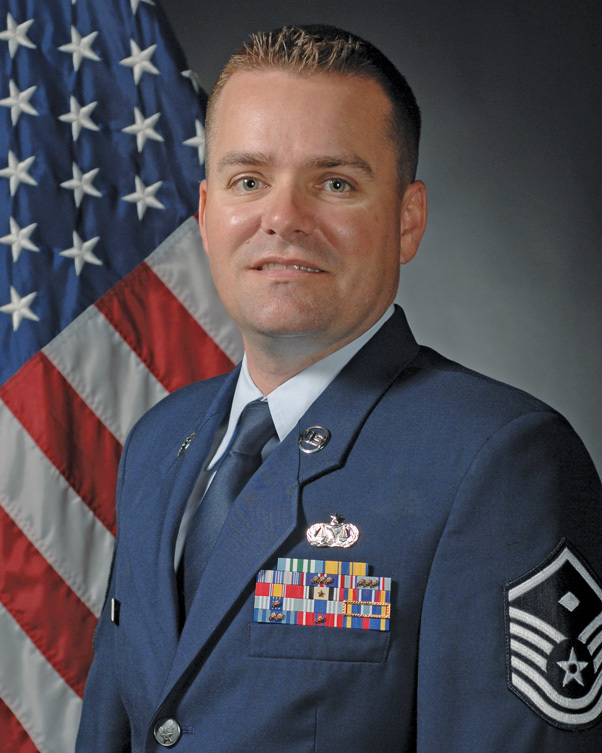 Jaime M. Lewis, 12th Air Force (Air Forces Southern), was welcomed as a new First Sgt. in May. The men and women of the 12th Air Force (Air Forces Southern) welcomed a new First Sgt. in May. Master Sgt. Jaime M. Lewis, began his career in 2000 as an Aerial Porter, where he performed duties such as passenger services, cargo warehouse worker, ramp services, special handling, and air terminal operation center controller. After serving in the Air Force for seven years he decided to follow his dream and become a paralegal. After completing his technical school training he was then stationed at Davis-Monthan AFB. While serving at the DM legal office he was given the opportunity to hone his craft and lead in many different areas. In 2014 Lewis decided to follow another calling this time it was becoming a First Sergeant, after completing his training assigned to the 43rd Electronic Communication Squadron before taking on the role of the 12th Air Force (Air Forces Southern) First Sgt. Question: What do you like about being a Numbered Air Force First Sergeant and how is it different from working at the squadron level? Lewis: What I like most about being a Numbered Air Force First Sergeant is being able to work with folks from a lot of different career fields and many different backgrounds in the Air Force. You don’t typically have that opportunity in a squadron because usually there aren’t so many different AFSC’s in one squadron. I think the main thing that stood out for me, that seems different from a squadron, is that everyone already has a tremendous amount of experience in their given career field. They are up at the NAF because they were more than likely the go to person at the squadron level. Also, a lot of the officers and directors have already been Squadron commanders or even Group commanders so that helps when you are dealing with issues that may come up. Question: What advice do you give to all of your inbound personnel? 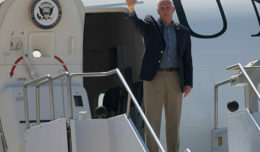 Lewis: The advice that I typically give depends on the member and how much experience they have in the Air Force, or if they are new to the DM area and Tucson community. Overall I would tell all our inbound folks that the experience in the NAF different than what they may have had at the squadron level. So be patient when trying to get something done, there may be different ways of handling things than at lower levels of command. I tell all our inbound folks that our AFSOUTH mission is very unique and that you will probably get some opportunities to experience the missions we are running in the AOR. With that said, make sure to be mindful of the different cultures in the countries you may get a chance to visit. Also, come to see me for anything. I don’t want to be thought of as a disciplinarian but more of a resource for guidance, whether personal or professional. And be sure to wear lots of sunblock here at DM! Question: What is a pet peeve of yours? Lewis: My biggest pet peeve would probably be someone in a leadership position taking things too personally. What I mean by that is, if one of our Airmen got in a situation where they did something wrong, we as leaders should not overreact. The person who made the mistake probably already feels terrible, they do not need to be reminded that they messed up over and over, or have someone getting angry at them for what they did. Don’t get me wrong, they do need to be accountable for their mistake but it needs to be done with proper guidance. They need to be told what they did was wrong and that there will be consequences for their actions. 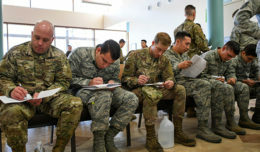 In my experience most Airmen want to be the best and do the best they can for the overall mission, sometimes they just get wrapped up in personal problems whether it be family, legal, or even peer pressure issues. 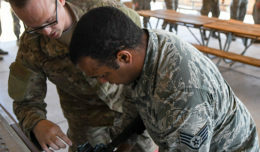 Question: As the Air Force continues to make adjustments in the rating system, what advice would you give to Airmen on staying competitive and being marketable to the Air Force? Lewis: Honestly I would say keep doing what you are doing. Overall the new system is going to help recognize the folks that really stand out and who go above and beyond our core values. What is also great is that the main purpose of the change is to highlight what’s most important to our Air Force, which is job performance. Again I go back to what I firmly believe, we are the greatest Air Force in the world and the reason behind that is simple. It’s not a certain aircraft or piece of technology that makes us head-and-shoulders above the rest; it’s our people, our Airmen that are out there doing the mission getting things done. Like what I saw down in Honduras with the New Horizon folks. Wow! Talk about doing something tremendous. Question: What has been your most rewarding assignment and why? Lewis: My most rewarding assignment has been the time I spent working in the Area Defense Counsel. The reason why was simple; everyone who walked into our office (ADC) was in some sort of trouble to some degree. So in my position as the Defense Paralegal I had to screen everyone who came in that office before the attorney ever talked to them. I had an opportunity to give good guidance and mentor young airman who may have made a small mistake. Now, I also had the opportunity to work serious cases which, to be honest, taught me a lot about patience and how to separate my personal beliefs from professional concerns. Question: What is the most rewarding part of being a First Sergeant? Lewis: The most rewarding part of being a First Sergeant is helping someone who is in need. Whether it is getting someone home on emergency leave, being able to be there to congratulate your Airmen on a milestone in their life, or even something as small as seeing that young airman finally get a chance to move out of the dorms. Overall just helping people, it is truly the most rewarding part, in my mind, that makes this job the best job in the Air Force.